Creamy, rich, tangy and delicious vegan lemon bars. Have them for dessert or as a snack. They are a treat you’ll fall in love with! 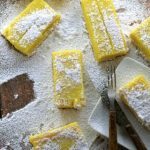 Creamy, rich, tangy and delicious vegan lemon bars. Have them for dessert, as a snack, They are a treat you’ll fall in love with!